On November 5, 2008, while I was sipping my morning cup of coffee, my friend dutifully sent me a message that Micheal Crichton, the man who was the one of the reasons I loved Science had passed away, I stopped my life for a moment and thought of a world without Crichton. When Pirate Latitudes hit the stands, I decided not to go to the second hand Moor Market, because I wanted to pay my final respects to the man. But I had read the reviews, New York Times had said :”The Crichton reputation and legacy are based on works far heartier than this.” True Enough. But they don’t get it, I would just read it because it didn’t matter, for it was Crichton once again and that was enough for me! Pirate Latitudes starts in a typical period novel fashion describing the morning abulations of a certain Jamaican governor Sir James Almont. The book gives an interesting insight on what Piracy and Privateering meant in 1665 Jamaica when the Governor hangs a pirate and offers a deal to a privateer in the same morning. This particular Privateer is the famous Captain Charles Hunter, our quintessential protagonist, he’s hot, adventurous, brave and is (as is the case with all heroes) a Ladies’ Man. He’s introduced in the book in a truly Jack Sparrow moment when he is peeing out into the streets. But there is one thing that has always set Crichton apart, the attention he pays to the crew, Charles Hunter is just a part of the story, the description of each member of Hunter’s crew is rather interesting(the Jew and Lazue take the awards for the weirdest pirates ever!) and so is the character of the damsel in distress Lady Sarah Almont and the Mrs-Robinson like character of Mrs. Robert Hacklett. Crichton did loose his touch with the precious slave girl Anne Sharp could’ve been better there. But who cares! It’s Crichton! come on! I lived through the pages of sea storms and gun battles and ultra cool navigational manoeuvres. I even believed him when he talked about Sea Monsters. 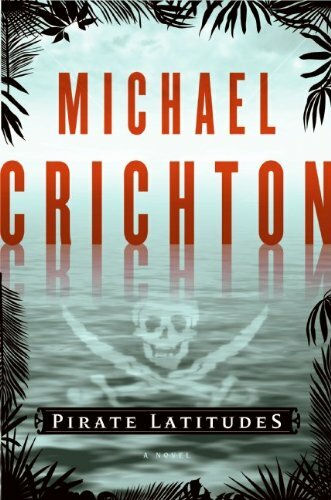 But essentially, I sailed the Spanish Main and back with Micheal Crichton and well…the journey was worth it!